Unpon arrival at the Airport in Uganda, our representative will take you to spend the night in a hotel in Kampala. After breakfast, your adventure will start heading northwest, towards the town of Masindi to reach the rhinoceros reserve of Ziwa, the Project that has brought the black and white rhinos back to Uganda, and appreciate them up close. Lunch. Your trip will continue to the largest national park in the country crossed by the Nile until it reaches Lake Albert. 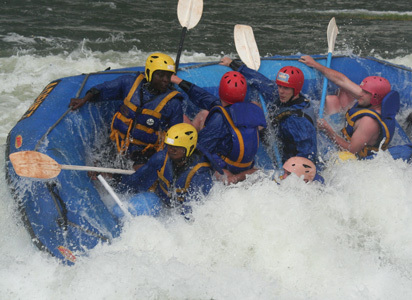 At the Murchison Falls the Nile passes through a very narrow place forming a spectacular and unforgettable waterfall. Before night falls you will be at the Paraa Safari Lodge / Murchison River Lodge (Supplement for Bakers Lodge) (C) Pakuba Safari Lodge (E) for dinner. FB Note: The trip is almost 6-7 hours, part of which will be through dirt roads inside the park. After a cup of coffee, you will start a safari in your own car to explore the savannah, in the northern region of the Nile delta on Lake Albert. You will find elephants, lions, buffalos, giraffes, water antelopes, oribies, leopards, as well as spotted hyenas. The park has a dense vegetation and offers a spectacular view. It is advisable to have your camera ready to take the best photos. Upon returning to your lodge you will have your breakfast and later your lunch. In the afternoon you will make another safari, but this time by boat along the banks of the Nile where you will see hippos, crocodiles and a variety of birds such as the African eagle-hawk, the rare beak shoe, common pelican, a variety of kingfishers, the goose of the Nile, etc. After breakfast, you will hike in the Budongo jungle, in Kaniyo-Pabidi, to find the chimpanzees in their habitat. Your specialized guide will accompany you during the tour. Among the primates you will find are the black and white colobus, the gray-cheeked mangabey, the green monkey, the blue monkey. Lunch. In the afternoon optional activity culture and visit to the fishing villages on the shores of Lake Albert. Dinner and night at Hoima, the capital of the Kingdom of Bunyoro. Heading south-west along Lake Albert and the banks of the Rift Valley with excellent views. It will cross plantations of sugarcane, tea, coffee, bananas and cocoa. You will arrive at Fort Portal, the capital of the kingdom of Toro in the shadow of Rwenzori, the largest mountain range in Africa. Lunch. You will arrive at the Queen Elizabeth Park and will make a safari on the way. Note: The trip is almost 7/8 hours, through dirt roads. In the morning you will make a safari in your own car along the roads of the northern sector of the park, towards Lake Jorge and the village of Kasenyi. Here you will have the opportunity to see lions, elephants, spotted hyenas, water antelopes and cobo antelopes, maybe you can see a leopard, although it is rare. The population of animals in the park has increased since the seventies and is now an excellent place to see animals and enjoy panoramic views, such as the crater lakes and the Rift Valley, which make this place special and unforgettable. Lunch. In the afternoon you will make an excursion through the Mweya peninsula on the Kazinga channel, one of the most beautiful places in Uganda for its concentration of jungle life and opportunities for good photographs. During this tour you will see endemic bird species, as well as hippos, buffalos and elephants. You will leave Queen Elizabeth Park heading south-west, to enter the rainforest, home to the last mountain gorillas in the world. Depending on weather conditions and the road will pass through the southern region of Ishasha sector of Queen Elizabeth Park, where there lives a rare population of lions known as "the climbing lions" that rest in the trees during the hot hours of the afternoon. Lunch. In the afternoon you will arrive to Bwindi in Buhoma via Ishasha, or to Kisoro for dinner and overnight. Note: The trip is very long, approximately 5-8 hours depending on the conditions of the roads and the location of the gorilla permits. The exact location of gorilla safaris depends on the availability of permits. Breakfast very early and departure to the southern tip of the country. The activity will start at 8 o'clock in the morning and with your specialized guide and a group of maximum eight people, you will reach the gorillas. The Bwindi forest contains a reserve of 370 gorillas that is half of the world's gorillas, some families of whom have become accustomed to receiving visitors. You will be able to observe and enjoy the view of these gentle giants and take photos. Do not forget to bring your picnic that the hotel will have prepared and water to refresh during the walk. After your trek in the afternoon you will travel towards Bunyonyi Lake. After breakfast you will cross the lake by canoe for a nature experience and bird watching, with a specialized guide. He will return to Entebbe. Lunch on the way. Breakfast very early and departure from Entebbe airport for Arusha. Upon arrival at the Arusha Killimanjaro International Airport, our representative will take you to continue the trip in Tanzania. Lunch. Continue along the ridge of the Ngorongoro crater enjoying views. After breakfast you will leave Ngorongoro to head towards the Serengeti National Park. Covering an area of 14,763 square kilometers, the park is the largest in Tanzania and is also part of the ecosystem of the Serengeti, the Ngorongoro crater and the Masai Mara in Kenya. They will go to the Oldupai Gorge (this is the original name of the so-called "Olduvai Gorge") which is located northwest of the Ngorongoro Crater.They can visit the Oldupai Gorge Museum and ask questions about the importance of the site for the history of humanity, lunch. Along the way you will see the "bomas", typical Maasai people and their cattle. After entering the national park, they will proceed through areas of grass and other semi-arid areas. The first safari will be made on the way to your lodge. After breakfast early, the trip will start with a long safari. They can choose if they want to return to the lodge for lunch and rest there or take their picnic and spend more time on the safari. The Seronera valley is a transitional area between open meadows in the south and forest plains in the northwest, criss-crossed by the Seronera and Orangi rivers that converge in the Grumeti river and which constitute the water reserve for the whole year. For this reason you will find in this area a very high concentration of fauna. Among the resident mammals may include giraffes, buffalo, impalas, Thompson's gazelles, forest antelope, leopards, líos, spotted hyenas and the black rhinoceros in danger of survival. The number of animals is highest when migration is made from the plains from north to south, between December and May, which is normally a rainy period. It is surprising to see the long columns of animals moving in one direction in search of water until the next dry season. You will return to your lodge. After breakfast, you will return to Arusha to catch the night flight back home. Half board. Note: It would be possible to spend the night in Arusha and in the morning continue the trip to Zanzibar and the Tanzanian coast.